Hamas political chief Ismail Haniyeh has vowed to stage protests against the decades-long Israeli occupation in the West Bank and abroad. Since March 30, Palestinians have been staging rallies along border of the Gaza Strip demanding the return of refugees to their towns and villages in historical Palestine from which they were driven in 1948 to make way for the new state of Israel. The rallies are part of a six-week protest that will culminate on May 15. That day will mark the 70th anniversary of Israel's establishment -- an event Palestinians refer to as the "Nakba" or "Catastrophe". “Rallies will move to the West Bank and will be joined by our people abroad,” Haniyeh told a meeting organized by the Ministry of Endowments and Religious Affairs in the Gaza Strip on Wednesday. He said the Palestinians “will rise up against the Israeli occupation in a popular resistance that started from Gaza”. “The ‘Return March’ will be the Palestinian people’s approach against the occupation,” he said, referring to the anti-occupation rallies. 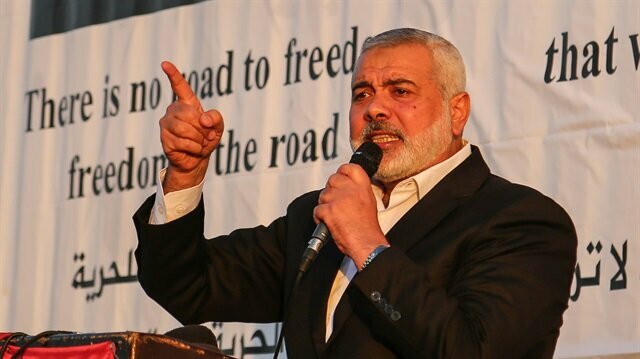 Haniyeh said the anti-occupation protests, now in the fifth week, “have achieved their goals, most notably is the return of the Palestinian cause to the forefront again." Emergency food aid for around a million Palestinians in Gaza may run out from June if the U.N. agency for Palestinian refugees cannot raise another $200 million following a cut-off in U.S. funding, the agency said on Tuesday.Pierre Kraehenbuehl, who heads the U.N. Relief and Works Agency (UNRWA) providing aid for Palestinians across the Middle East, said U.S. President Donald Trump had withheld $305 million in funding, far more than the $65 million reported in January. "You already have a very, very fragile community (in Gaza)," Kraehenbuehl told Reuters in an interview during an international donor conference in Syria in Brussels. "So if you suddenly have no certainty about the amount of food aid coming from the U.N. for a million people ... you can just imagine the kind of effects it could have," he said, although he stressed he was not justifying any link to potential outbreaks of unrest.Gazan awarded by Erdoğan amputated by Israeli shootingGulf states, Norway, Turkey and Canada have stepped in with a total of $200 million to help meet a $446 million budget deficit for 2018. UNRWA's planned budget is over a billion dollars for 2018.The United States, long the biggest donor to the agency, is providing just $60 million of a promised $365 million, Kraehenbuehl said.That leaves a $200 million shortfall to fill for rice, flour, sugar and also to keep funding schools in Gaza and the West Bank and elsewhere in the Middle East.The U.N. agency's call for help is made harder by the competing demands on donors for crises in Syria, Yemen, Myanmar, Afghanistan and the Democratic Republic of Congo, among others.Israel detains eight Palestinians in West Bank raidsKraehenbuehl warned of greater instability in Gaza in part because the economy is already suffering its deepest collapse after a decade of Israeli-led blockades, and internal Palestinian divisions in the coastal strip.Kraehenbuehl said the shortfall in funding for the agency could also mean there may not be enough money to re-open schools in August and September for the new academic year. "This is our largest funding crisis ever," he said.More than two million Palestinians are packed into Gaza and while Israel withdrew its troops and settlers in 2005, it maintains tight control of Gaza's land and sea borders. Egypt also restricts movement in and out of Gaza on its border.At least three Palestinians injured by Israeli army on Gaza borderRAMADAN DONATIONS?Trump withheld the aid to UNRWA in January after questioning the value of such funding, while the U.S. State Department said the agency needed to make unspecified reforms.Many Western diplomats saw Trump's decision as a reaction to the condemnation across the Middle East of his Dec. 6 decision to recognise Jerusalem as Israel's capital and before any peace settlement between Israelis and Palestinians. The United Nations also voted to reject that recognition.Kraehenbuehl, a Swiss national, said he had enacted spending cuts to contain costs within the agency and was trying to find new donors in the private sector. Those could be in Gulf countries, or donations made in solidarity with the Palestinians during the Muslim holy month of Ramadan.Kraehenbuehl said that after donors such as Qatar, Turkey and the United Arab Emirates had come forward, he would now seek help from Germany, France, Sweden and Britain, travelling to Berlin later this week. Israel is not a contributor to UNRWA. "It's a modest investment to preserving the region from future instability and uncertainty," he said. At least 41 Palestinians have been killed and hundreds injured by Israeli gunfire since the protests began last month. Observers believe that the rallies aim to break Israel’s decade-long siege on the Gaza Strip, as well as to thwart a U.S.-proposed “Deal of the Century” -- ostensibly aimed at resolving the decades-long Israel-Palestine conflict. The peace plan reportedly calls for across-the-board Arab recognition of Jerusalem as Israel’s capital and the annexation by Israel of large West Bank settlement blocs. In return, Israel would be expected to stage a gradual withdrawal from most Palestinian areas now under occupation. In 2016, Alaa al-Dali, a Palestinian youth in the Gaza Strip, was awarded a bicycle by Turkish President Recep Tayyip Erdoğan.Two years later, the 21-year-old man lost his leg after being shot by Israeli soldiers stationed on border of the Gaza Strip during protests against the decades-long Israeli occupation.“I feel the [Israeli] occupation has destroyed all my dreams,” al-Dali told Anadolu Agency in an exclusive interview.The Palestinian youth received his bike as a personal gift from Erdogan in September 2016. Even since, he has been using the bike for training to become a professional biker.Turkey sent around 14,000 tons of aid to the Gaza Strip aboard two vessels in in 2016 and a third in mid- 2017 as part of Turkish effort to alleviate the suffering of nearly two million Gazans, who have been reeling under a crippling Israeli blockade imposed since 2017.“We thank Turkey for its support for us,” al-Dali said.“I hope Turkey will continue to support us so that we can continue our sports dreams," he said.Israel detains eight Palestinians in West Bank raidsAt least three Palestinians injured by Israeli army on Gaza borderLost dreamAl-Dali began his passion of biking when he was eight years-old and joined the Palestinian national team in 2014 and won a number of medals.He was set to take part with the Palestinian national team in a race contest in the Indonesian capital Jakarta next month.Now, his plans have hit a dead end after losing his leg.Recalling his injury, al-Dali said he was wearing his sport outfit and was standing peacefully some 200 meters far from the borderline when he was shot in his right leg.“I fell to the ground after being shot,” the Palestinian youth bitterly recalled.He was moved to a nearby hospital, but it was overwhelmed with injured Gazans, forcing him to wait for around three hours to get medical attention.The Palestinian biker spent two days in intensive care and underwent eight operations in an effort to save his future career but all in vain that amputation was the only option.He underwent an artery transplant operation but also failed.“The operation failed because of the effect of the explosive bullet used by Israeli soldiers that dissolves any implanted artery,” al-Dali said.At least 41 Palestinians have been killed and hundreds injured by Israeli gunfire since Palestinian protests demanding the return of refugees to their towns and villages in historical Palestine from which they were driven in 1948 to make way for the new state of Israel began on March 30.The rallies are part of a six-week protest that will culminate on May 15. That day will mark the 70th anniversary of Israel's establishment -- an event Palestinians refer to as the "Nakba" or "Catastrophe". So far, however, the Palestinian leadership has voiced its rejection of the initiative’s terms. Last December, U.S. President Donald Trump Trump recognized Jerusalem as Israel’s capital, triggering world outcry and protests in the Palestinian territories. At least three Palestinians were injured on Tuesday after Israeli military forces shot them on the eastern border between the Gaza Strip and Israel during their participation in the peaceful Marches of Return and Breaking of the Siege.According to field medics, three Palestinians were injured in the leg when the Israeli army shot them with live bullets.Two of the wounded were transported to the Jabalia refugee camp in the northern Gaza Strip, while one was taken to Khan Younis in the south, they added.Since March 30, when the peaceful Marches of Return and Breaking of the Siege began, at least 41 Palestinians have been martyred and almost 4,000 others injured by Israeli attacks.Israel arrests two Palestinians on Gaza borderExplosion kills Palestinian in GazaThe border rallies in Gaza are part of a six-week protest set to culminate on May 15. That day will mark the 70th anniversary of Israel's establishment -- an event Palestinians refer to as "the Catastrophe.”Demonstrators demand that Palestinian refugees be granted the “right of return” to their towns and villages in historical Palestine from which they were driven in 1948 to make way for the new state of Israel. They also aim to break the 12-year siege of the Gaza Strip.